(Stafford Springs, CT)—Following last week’s announcement of the Casagrande Builders Street Stock 25, the excitement surrounding the 2018 season for the Street Stock division at Stafford Speedway has been high. In addition to the increased weekly purse and lap count, as well as the new Casagrande Builders 25, the Street Stock division will take center stage for a 2nd time in 2018 with the R.A.D. 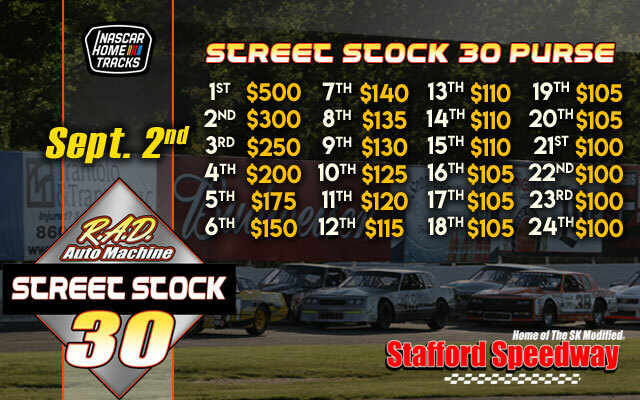 Auto Machine Street Stock 30 on Friday, September 7th. The event will boast a $3,595 purse and will pay $500 to win and $100 to start. The longest race in the history of the Street Stocks, the 30-lap distance will be a test for teams and drivers. Historically the Street Stocks, formerly the Dare Stock division, competed at a weekly distance of 15 laps, making the 30-lap feature on September 7th double the distance. Drivers and teams will have a full season of preparation as the 30-lap special will be held in early September. The favorite going into the September 7th event will most notably be back to back Street Stock Champion Johnny Walker, who has dominated the last 2 seasons with consistency. Walker will be chased by a mix of young and veteran drivers with nearly all drivers competing in 2017 returning in 2018, including rookie of the year George Bessette who is poised for a breakout season in 2018. The 2018 Street Stock season kicks off with the 47th Annual NAPA Auto Parts Spring Sizzler® on April 27-29. Tickets for the “Greatest Race in the History of Spring” are on sale now at the Speedway Box Office. Tickets are priced at $40.00 for adult general admission tickets, $5.00 for children ages 6-14, and children ages 5 and under are admitted free of charge when accompanied by an adult. Reserved seating is priced at $42.00 for all ages. As always, Stafford Motor Speedway offers free parking with overnight parking available. All tickets are good for both Saturday and Sunday admission. All ticket prices include 10% CT Admission Tax. 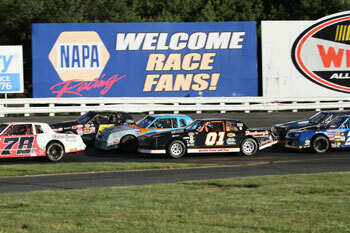 Discount Spring Sizzler® tickets will be available beginning in March at participating NAPA Auto Parts stores.